WASHINGTON — Scott Pruitt, head of the Environmental Protection Agency, said Thursday that the Trump administration will replace President Barack Obama's Clean Power Plan, which it is currently moving to repeal. In his first appearance before Congress since his February confirmation, Pruitt said that the EPA would be "introducing a replacement rule" for the Clean Power Plan to reduce carbon dioxide emissions, which was the centerpiece of the Obama administration’s climate-change efforts. The EPA announced in October that it would scrap the plan, but did not indicate at the time that it would replace it. Pruitt said that the EPA had decided to withdraw the Clean Power Plan largely because of "jurisdictional issues." But during Thursday's testimony before a House Energy and Commerce subcommittee, he also questioned the 2009 scientific review that had led the Obama administration to devise the plan in the first place. 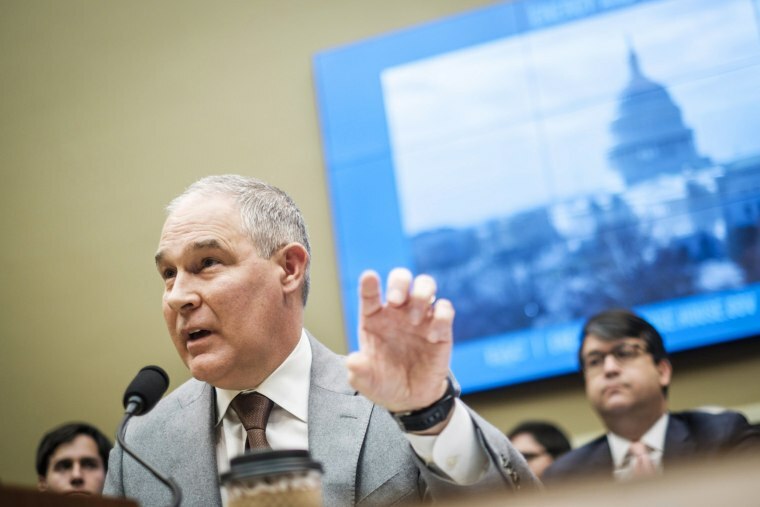 Under Obama, the agency had committed "a breach in process" in 2009 by relying on scientific findings from the United Nations in determining that greenhouse gas emissions endanger public health and welfare, Pruitt told lawmakers. "They took work from the U.N. [Intergovernmental Panel on Climate Change] and transported it to the agency and adopted that as the core of the finding," Pruitt said. "There was a breach in process that occurred in 2009 that many believe wasn’t handed the proper way." Because of the 2009 endangerment finding, the EPA is legally required to regulate greenhouse gases. That ultimately prompted the Obama administration to move forward with the Clean Power Plan in 2015. The Obama-era policy aimed to reduce carbon emissions from the power sector by 32 percent by 2030, as compared to 2005 levels. Pruitt's criticism of the 2009 endangerment finding prompted Rep. Joe Barton, R-Tex. to advise him "to go back and revisit the finding document." Overturning the rule would allow the Trump administration to go much farther in undoing emission rules. But legal experts say the endangerment finding would challenging to reverse, given the mounting scientific evidence about the harms of greenhouse gases. At the hearing, Pruitt also said that the EPA is moving forward with its "red team, blue team" exercise to challenge the mainstream science on climate change, adding that the initiative could begin as soon as January. House Democrats criticized Pruitt for launching a full-scale attack on scientific integrity at the EPA. "Rules across the agency are being undone capriciously with little regard to human impacts or the science that went into developing them," said Rep. Paul Tonko, D-N.Y., pointing to the agency’s rollback of climate change and pesticide regulation, as well as its decision to ban scientists who are receiving EPA grants from serving on the agency’s independent advisory boards. "EPA has all the signs of an agency captured by industry," Tonko added. Pruitt defended the EPA’s commitment to science as "central and core to what we do" and highlighted the agency’s focus on cleaning up hazardous waste. "As we’ve engaged in our Superfund focus, I’ve had career employees come up to me and say, 'Thank you for awakening areas that have been dormant for a little while,'" Pruitt said. But Rep. Frank Pallone, D-N.J., accused Pruitt of undermining the new chemical regulations by letting industry lobbyists drive the process and moving forward with rules that are “not consistent with the law in very dangerous ways.” He grilled Pruitt about the role of Nancy Beck, a former executive for the chemical industry’s top trade association who’s now leading the EPA’s effort to regulate toxic chemicals. “Did you ask Nancy Beck to recuse herself?” Pallone asked Pruitt, pressing him about Beck’s role in rewriting the agency’s rules for toxic chemical regulation. Pruitt began to explain the EPA’s internal ethics process, but Pallone grew frustrated when he didn’t respond directly to his pointed question. “He refuses to answer the question — he obviously hasn’t recused her,” Pallone said. Democrats also pressed Pruitt about his frequent government travel to his home state of Oklahoma, as well as his use of military and private jets at taxpayer expense, all of which the EPA's Inspector General is currently investigating. Pruitt maintained that all his travel was "business-related" and warranted by his work. Republicans, meanwhile, praised Pruitt for working to scale back federal regulation and empower states. "Thank you for going to places like Oklahoma and North Dakota, and other states in the middle of real America that are affected by, for the last eight years, what has simply been a dictatorship by the EPA," said Rep. Kevin Cramer, R-N.D.